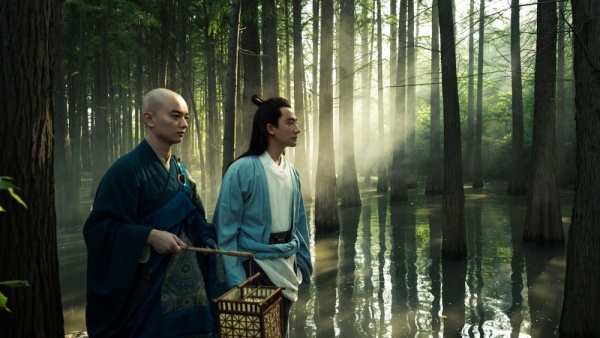 With his epic screen adaptation of Baku Yumemakura's bestselling novel, Legend of the Demon Cat, director Chen Kaige returns to big budget cinema with an enchanting and visually stunning tale of love, intrigue, mysticism, and poetry set in a fantasized vision of the Tang dynasty. Central to the story are two key historical figures: Bai Juyi, one of the greatest Chinese poets — whose lyrics embodied the spirit of the Tang dynasty and became a style model for Japanese literature — and Japanese monk Kûkai, who first brought to Japan the secrets of esoteric Buddhism. Kûkai travels to China to study. Once there, he is summoned to court to use his exorcisms to cure the possessed Emperor, Xuanzong. When he gets to the palace, the Emperor dies before his eyes, but not before Kûkai detects what may have caused the death: a talking black cat, whose tufts of hair are scattered all over the Emperor's chamber. With the help of the poet Bai Letian, the monk identifies the cat as the restless spirit of Yang Guifei the imperial concubine murdered by the previous emperor. The film's faithful reconstruction of the imperial capital Chang'an is a true marvel. A real city from the past was built over the course of five years (at an estimated cost of US$200 million), bringing to the screen the spellbinding magic of the times, an exquisite complement to Chen's masterful storytelling.